Apprising Ministries is doing what we can to draw attention to the New Downgrade No-Controversy happening within evangelicalism and growing syncretism as spiritual blindness and apostasy increase. Unfortunately, at a time when the church visible could desperately use one, I’m afraid there doesn’t appear to be a Charles Spurgeon arising. If anything mainstream Christendom seems to heading away from Spurgeon. In fact, it’s becoming so bad that today we see evangelical leaders are even hedging on the Church of Jesus Christ of Latter-day Saints (the Mormons), which has long ago correctly been labeled a non-Christian cult. For example, I told you in Jerry Falwell, Jr.: Liberty University has “No Official Position” On The Cult Of Mormonism about a mini-flap when it was announced that Mitt Romney was to address Liberty University (LU) . This is a problem because Liberty University is reputed to be “the world’s largest” evangelical Christian university “in the world.” Against this backdrop I bring you a piece by David Badash at The New Civil Rights Movement. 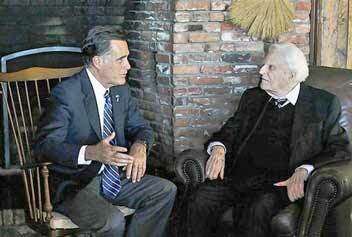 “It was an honor to meet and host Governor Romney in my home today, especially since I knew his late father former Michigan Governor George Romney, whom I considered a friend,” the 93-year old Christian Evangelist Southern Baptist minister said via a statement. You need to understand here that this isn’t Paul’s personal opinion; it’s not a simply a suggestion, it is the Word of the LORD God Almighty Himself. God does not want His children joining in religious endeavors with idolators. Now of course I can pray for Mitt Romney, but I have no basis to pray with him. Right now Romney is condemned by God and under His wrath (cf. John 3:18. 36); because I love him for Christ’s sake, I do pray for his salvation. 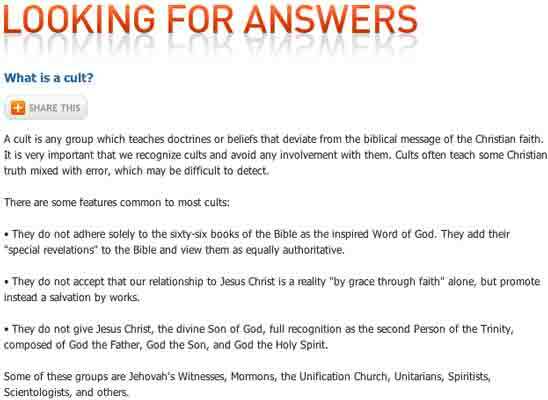 A cult is any group which teaches doctrines or beliefs that deviate from the biblical message of the Christian faith. It is very important that we recognize cults and avoid any involvement with them. Cults often teach some Christian truth mixed with error, which may be difficult to detect. • They do not adhere solely to the sixty-six books of the Bible as the inspired Word of God. They add their “special revelations” to the Bible and view them as equally authoritative. • They do not accept that our relationship to Jesus Christ is a reality “by grace through faith” alone, but promote instead a salvation by works. • They do not give Jesus Christ, the divine Son of God, full recognition as the second Person of the Trinity, composed of God the Father, God the Son, and God the Holy Spirit. The truth is BGEA is not doing the Christian community, and certainly not unbelievers, a service by removing a webpage that tells people the truth. Stealth evangelism simply doesn’t work. Let me give you a recent example. I have always been a big fan of Oprah Winfrey. Growing up, I remember faithfully watching her show every day after school… So when the opportunity came to attend a taping of her “Lifeclass” show in Houston, I snagged it. The icing on the cake? Pastor Rick Warren was her guest. She provides a number of quotes from Warren with which she agreed. An honest reading of her piece reveals that she was impressed with Rick Warren’s trite human potential movement statements a la Robert Schuller. This woman, enslaved to the idolatry of Islam, didn’t hear the Gospel of Jesus Christ; rather, she went home affirmed in her sin because arguably the most visible Southern Baptist pastor in the world never defined his terms. Anyone who believes in “God” could affirm what Rick Warren says in public; that’s a large reason for his “success” in the world. As far as Mitt Romney himself, from LDS sources, I’ll leave you with the god he believes in. I’ve mentioned before that I’ve been in the ministry fields of apologetics, Comparative Religion, and counter-cult evangelicism for nearly 25 years; and lived in a heavily Mormon area of southwestern Wyoming for 10 of them. The fact is the LDS god is an exalted man and Mormonism teaches that you can become a god yourself. What I’m going to show you now is precisely what the Mormon Church, which Mitt Romney is with, teaches about God. It’s important to keep in mind here that in Mormonism the Trinity has also been redefined. Instead of, within the nature of the one God there are three co-eternal, co-equal Persons Who are the one God, the LDS Church teaches that Heavenly Father (Elohim), Jesus (Jehovah), and the Holy Ghost, are three separate gods—among a pantheon of gods—working together with one purpose. Because we are made in his image (see Moses 6:9), we know that God has a body that looks like ours. His eternal spirit is housed in a tangible body of flesh and bones (see D&C 130:22). God’s body, however, is perfected and glorified, with a glory beyond all description. In beginning to close this, for now, it’s an incontrovertible fact that Mormonism is polytheistic (many gods cf.Abraham 4:1), whereas Christianity is monotheistic (one God cf. Isaiah 43:10). We’ve seen that the LDS Heavenly Father—whose name is Elohim—has a body. However, the eyewitness testimony of the Apostle John in his Gospel deposition quotes the real Jesus telling us that the one true and living God of the Bible — is spirit (John 4:24). Thus says the Lord, the King of Israel and his Redeemer, the Lord of hosts: “I am the first and I am the last; besides me there is no god. Who is like me? Let him proclaim it. Let him declare and set it before me, since I appointed an ancient people.